1 A None No Power Seat 1 A is a First Class flat bed seat. This seat is quiet and private, but it can feel claustrophobic as it is located in the nose of the plane. 1 B None No Power Seat 1 B is a First Class flat bed seat. This seat is quiet and private, but it can feel claustrophobic as it is located in the nose of the plane. 1 H None No Power Seat 1 H is a First Class flat bed seat. This seat is quiet and private, but it can feel claustrophobic as it is located in the nose of the plane. 1 J None No Power Seat 1 J is a First Class flat bed seat. This seat is quiet and private, but it can feel claustrophobic as it is located in the nose of the plane. 16 A None No Power Seat 16 A is a Prestige Class angle lie flat seat and has limited legroom due to the close proximity of the bulkhead. There is no floor storage during takeoff and landing. This is a bassinet position so passengers with infants are often seated here. Proximity to the lavatory may be bothersome. 16 B None No Power Seat 16 B is a Prestige Class angle lie flat seat and has limited legroom due to the close proximity of the bulkhead. There is no floor storage during takeoff and landing. This is a bassinet position so passengers with infants are often seated here. Proximity to the lavatory may be bothersome. 16 H None No Power Seat 16 H is a Prestige Class angle lie flat seat and has limited legroom due to the close proximity of the bulkhead. There is no floor storage during takeoff and landing. This is a bassinet position so passengers with infants are often seated here. Proximity to the lavatory may be bothersome. 16 J None No Power Seat 16 J is a Prestige Class angle lie flat seat and has limited legroom due to the close proximity of the bulkhead. There is no floor storage during takeoff and landing. This is a bassinet position so passengers with infants are often seated here. Proximity to the lavatory may be bothersome. 17 A None No Power Seat 17 A is a standard Prestige Class angle lie flat seat. 17 B None No Power Seat 17 B is a standard Prestige Class angle lie flat seat. 17 H None No Power Seat 17 H is a standard Prestige Class angle lie flat seat. 17 J None No Power Seat 17 J is a standard Prestige Class angle lie flat seat. 18 A None No Power Seat 18 A is a standard Prestige Class angle lie flat seat. 18 B None No Power Seat 18 B is a standard Prestige Class angle lie flat seat. 18 H None No Power Seat 18 H is a standard Prestige Class angle lie flat seat. 18 J None No Power Seat 18 J is a standard Prestige Class angle lie flat seat. 19 A None No Power Seat 19 A is a Prestige Class angle lie flat seat. This seat has extra legroom due to the exit row. 19 B None No Power Seat 19 B is a Prestige Class angle lie flat seat. 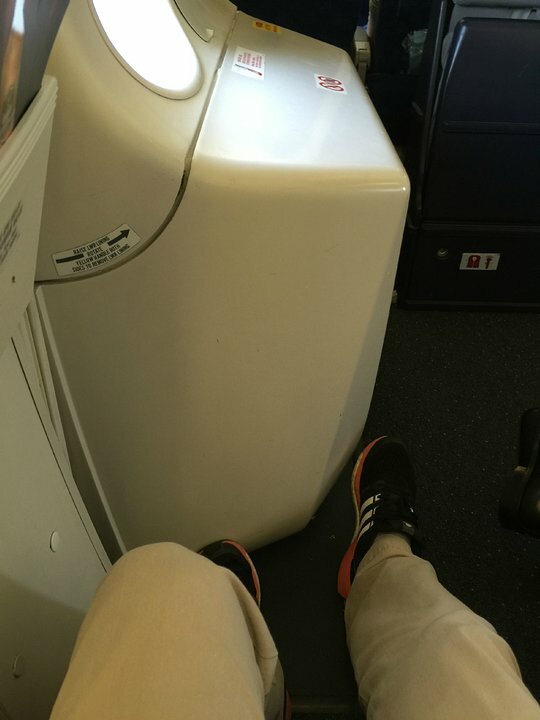 This seat has extra legroom due to the exit row. 19 H None No Power Seat 19 H is a Prestige Class angle lie flat seat. This seat has extra legroom due to the exit row. 19 J None No Power Seat 19 J is a Prestige Class angle lie flat seat. This seat has extra legroom due to the exit row. 2 A None No Power Seat 2 A is a standard First Class flat bed seat. 2 B None No Power Seat 2 B is a standard First Class flat bed seat. 2 H None No Power Seat 2 H is a standard First Class flat bed seat. 2 J None No Power Seat 2 J is a standard First Class flat bed seat. 20 A None No Power Seat 20 A is a standard Prestige Class angle lie flat seat. 20 B None No Power Seat 20 B is a standard Prestige Class angle lie flat seat. 20 H None No Power Seat 20 H is a standard Prestige Class angle lie flat seat. 20 J None No Power Seat 20 J is a standard Prestige Class angle lie flat seat. 21 A None No Power Seat 21 A is a standard Prestige Class seat, although proximity to the lavatory and galley may be bothersome. 21 B None No Power Seat 21 B is a standard Prestige Class seat, although proximity to the lavatory and galley may be bothersome. 21 H None No Power Seat 21 H is a standard Prestige Class seat, although proximity to the lavatory and galley may be bothersome. 21 J None No Power Seat 21 J is a standard Prestige Class seat, although proximity to the lavatory and galley may be bothersome. 28 A None No Power Seat 28 A has extra legroom due to the location of the bulkhead, however close proximity to the galley may be bothersome. The tray table is in the armrest, making the armrest immovable and slightly reducing seat width. There is no floor storage during takeoff and landing. This is a bassinet position so passengers with infants are often seated here. 28 B None No Power Seat 28 B has extra legroom due to the location of the bulkhead, however close proximity to the galley may be bothersome. The tray table is in the armrest, making the armrest immovable and slightly reducing seat width. There is no floor storage during takeoff and landing. This is a bassinet position so passengers with infants are often seated here. 28 C None No Power Seat 28 C has extra legroom due to the location of the bulkhead, however close proximity to the galley may be bothersome. The tray table is in the armrest, making the armrest immovable and slightly reducing seat width. There is no floor storage during takeoff and landing. This is a bassinet position so passengers with infants are often seated here. 3 A None No Power Seat 3 A is a standard First Class flat bed seat. 3 B None No Power Seat 3 B is a standard First Class flat bed seat. 3 H None No Power Seat 3 H is a standard First Class flat bed seat. 3 J None No Power Seat 3 J is a standard First Class flat bed seat. 30 D None No Power Seat 30 D has plenty of extra legroom. The tray table is in the armrest, making the armrest immovable and slightly reducing seat width. There is no floor storage during takeoff and landing. 30 E None No Power Seat 30 E has plenty of extra legroom. The tray table is in the armrest, making the armrest immovable and slightly reducing seat width. There is no floor storage during takeoff and landing. 30 F None No Power Seat 30 F has plenty of extra legroom. The tray table is in the armrest, making the armrest immovable and slightly reducing seat width. There is no floor storage during takeoff and landing. 30 G None No Power Seat 30 G has plenty of extra legroom. The tray table is in the armrest, making the armrest immovable and slightly reducing seat width. There is no floor storage during takeoff and landing. 30 H None No Power Seat 30 H has plenty of extra legroom. The tray table is in the armrest, making the armrest immovable and slightly reducing seat width. There is no floor storage during takeoff and landing. This is a bassinet position so passengers with infants are often seated here. 30 J None No Power Seat 30 J has plenty of extra legroom. The tray table is in the armrest, making the armrest immovable and slightly reducing seat width. There is no floor storage during takeoff and landing. This is a bassinet position so passengers with infants are often seated here. 30 K None No Power Seat 30 K has plenty of extra legroom. The tray table is in the armrest, making the armrest immovable and slightly reducing seat width. There is no floor storage during takeoff and landing. This is a bassinet position so passengers with infants are often seated here. 37 A None No Power Seat 37 A may have limited recline, and the proximity of the lavatories can be bothersome. 37 B None No Power Seat 37 B may have limited recline, and the proximity of the lavatories can be bothersome. 37 C None No Power Seat 37 C may have limited recline, and the proximity of the lavatories can be bothersome. 37 D None No Power Seat 37 D may have limited recline, and the proximity of the lavatories can be bothersome. 37 E None No Power Seat 37 E may have limited recline, and the proximity of the lavatories can be bothersome. 37 F None No Power Seat 37 F may have limited recline, and the proximity of the lavatories can be bothersome. 37 G None No Power Seat 37 G may have limited recline, and the proximity of the lavatories can be bothersome. 37 H None No Power Seat 37 H may have limited recline, and the proximity of the lavatories can be bothersome. 37 J None No Power Seat 37 J may have limited recline, and the proximity of the lavatories can be bothersome. 37 K None No Power Seat 37 K may have limited recline, and the proximity of the lavatories can be bothersome. 38 A None No Power Seat 38 A has extra legroom, but some of the space is impeded by the slide that protrudes from the exit door. Proximity to the lavatories can be bothersome as passengers tend to congregate in this area. The tray table is in the armrest, making the armrest immovable and slightly reducing seat width. There is no floor storage for this seat during takeoff and landing. It can get cold by the exits during flight. 38 B None No Power Seat 38 B has extra legroom due to the emergency exit. Proximity to the lavatories may be bothersome. The tray table is in the armrest, making the armrest immovable and slightly reducing seat width. There is no floor storage during takeoff and landing. 38 C None No Power Seat 38 C has extra legroom due to the emergency exit. Proximity to the lavatories may be bothersome. The tray table is in the armrest, making the armrest immovable and slightly reducing seat width. There is no floor storage during takeoff and landing. 38 H None No Power Seat 38 H has extra legroom due to the emergency exit. Proximity to the lavatories may be bothersome. The tray table is in the armrest, making the armrest immovable and slightly reducing seat width. There is no floor storage during takeoff and landing. 38 J None No Power Seat 38 J has extra legroom due to the emergency exit. Proximity to the lavatories may be bothersome. The tray table is in the armrest, making the armrest immovable and slightly reducing seat width. There is no floor storage during takeoff and landing. 38 K None No Power Seat 38 K has extra legroom, but some of the space is impeded by the slide that protrudes from the exit door. Proximity to the lavatories can be bothersome as passengers tend to congregate in this area. The tray table is in the armrest, making the armrest immovable and slightly reducing seat width. There is no floor storage for this seat during takeoff and landing. It can get cold by the exits during flight. 40 D None No Power Seat 40 D has slightly restricted due to the bulkhead. Proximity to the lavatories may be bothersome. The tray table is in the armrest, making the armrest immovable and slightly reducing seat width. There is no floor storage during takeoff and landing. This is a bassinet position, so passengers with infants are often seated here. 40 E None No Power Seat 40 E has slightly restricted due to the bulkhead. Proximity to the lavatories may be bothersome. The tray table is in the armrest, making the armrest immovable and slightly reducing seat width. There is no floor storage during takeoff and landing. This is a bassinet position, so passengers with infants are often seated here. 40 F None No Power Seat 40 F has slightly restricted due to the bulkhead. Proximity to the lavatories may be bothersome. The tray table is in the armrest, making the armrest immovable and slightly reducing seat width. There is no floor storage during takeoff and landing. This is a bassinet position, so passengers with infants are often seated here. 40 G None No Power Seat 40 G has slightly restricted due to the bulkhead. Proximity to the lavatories may be bothersome. The tray table is in the armrest, making the armrest immovable and slightly reducing seat width. There is no floor storage during takeoff and landing. This is a bassinet position, so passengers with infants are often seated here. 46 D None No Power Seat 46 D may have limited recline and the proximity of the galley may be bothersome. 46 E None No Power Seat 46 E may have limited recline and the proximity of the galley may be bothersome. 46 F None No Power Seat 46 F may have limited recline and the proximity of the galley may be bothersome. 46 G None No Power Seat 46 G may have limited recline and the proximity of the galley may be bothersome. 47 A None No Power Seat 47 A may have limited recline and the proximity of the galley may be bothersome. 47 B None No Power Seat 47 B may have limited recline and the proximity of the galley may be bothersome. 47 C None No Power Seat 47 C may have limited recline and the proximity of the galley may be bothersome. 47 H None No Power Seat 47 H may have limited recline and the proximity of the galley may be bothersome. 47 J None No Power Seat 47 J may have limited recline and the proximity of the galley may be bothersome. 47 K None No Power Seat 47 K may have limited recline and the proximity of the galley may be bothersome. 48 A None No Power Seat 48 A is an Economy Class exit row seat however the exit door may protrude into your legroom. The proximity of the galleys may be bothersome as passengers often congregate in this area. The tray table is in the armrest, making the armrest immovable and slightly reducing seat width. There is no floor storage for this seat during take-off and landing. It can be cold near the exit door during flight. 48 B None No Power Seat 48 B is an Economy Class exit row seat that has extra legroom, however the proximity of the galleys may be bothersome as passengers often congregate in this area. The tray table is in the armrest, making the armrest immovable and slightly reducing seat width. There is no floor storage for this seat during take-off and landing. It can be cold near the exit door during flight. 48 C None No Power Seat 48 C is an Economy Class exit row seat that has extra legroom, however the proximity of the galleys may be bothersome as passengers often congregate in this area. The tray table is in the armrest, making the armrest immovable and slightly reducing seat width. There is no floor storage for this seat during take-off and landing. It can be cold near the exit door during flight. 48 H None No Power Seat 48 H is an Economy Class exit row seat that has extra legroom, however the proximity of the galleys may be bothersome as passengers often congregate in this area. The tray table is in the armrest, making the armrest immovable and slightly reducing seat width. There is no floor storage for this seat during take-off and landing. It can be cold near the exit door during flight. 48 J None No Power Seat 48 J is an Economy Class exit row seat that has extra legroom, however the proximity of the galleys may be bothersome as passengers often congregate in this area. The tray table is in the armrest, making the armrest immovable and slightly reducing seat width. There is no floor storage for this seat during take-off and landing. It can be cold near the exit door during flight. 48 K None No Power Seat 48 K is an Economy Class exit row seat however the exit door may protrude into your legroom. The proximity of the galleys may be bothersome as passengers often congregate in this area. The tray table is in the armrest, making the armrest immovable and slightly reducing seat width. There is no floor storage for this seat during take-off and landing. It can be cold near the exit door during flight. 49 C None No Power Seat 49 C is an Economy Class seat whose close proximity to the galleys may be bothersome, especially on overnight flights when trying to sleep. 49 H None No Power Seat 49 H is an Economy Class seat whose close proximity to the galleys may be bothersome, especially on overnight flights when trying to sleep. 50 C None No Power Seat 50 C is an Economy Class seat whose close proximity to the galleys may be bothersome, especially on overnight flights when trying to sleep. 50 H None No Power Seat 50 H is an Economy Class seat whose close proximity to the galleys may be bothersome, especially on overnight flights when trying to sleep. 51 D None No Power Seat 51 D is an Economy Class Bulkhead seat that may have restricted legroom due to the position of the bulkhead. The close proximity to the galley may be bothersome. Passengers traveling with infants are often seated at this bulkhead. The tray table is in the armrest, making the armrest immovable and slightly reducing seat width. There is no floor storage for this seat during take-off and landing. 51 E None No Power Seat 51 E is an Economy Class Bulkhead seat that may have restricted legroom due to the position of the bulkhead. The close proximity to the galley may be bothersome. Passengers traveling with infants are often seated at this bulkhead. The tray table is in the armrest, making the armrest immovable and slightly reducing seat width. There is no floor storage for this seat during take-off and landing. 51 F None No Power Seat 51 F is an Economy Class Bulkhead seat that may have restricted legroom due to the position of the bulkhead. The close proximity to the galley may be bothersome. Passengers traveling with infants are often seated at this bulkhead. The tray table is in the armrest, making the armrest immovable and slightly reducing seat width. There is no floor storage for this seat during take-off and landing. 51 G None No Power Seat 51 G is an Economy Class Bulkhead seat that may have restricted legroom due to the position of the bulkhead. The close proximity to the galley may be bothersome. Passengers traveling with infants are often seated at this bulkhead. The tray table is in the armrest, making the armrest immovable and slightly reducing seat width. There is no floor storage for this seat during take-off and landing. 62 B None No Power Seat 62 B is in the last row of the aircraft and may have limited recline. 62 C None No Power Seat 62 C is in the last row of the aircraft and may have limited recline. 62 H None No Power Seat 62 H is in the last row of the aircraft and may have limited recline. 62 J None No Power Seat 62 J is in the last row of the aircraft and may have limited recline. 63 D None No Power Seat 63 D is in the last row of the aircraft and may have limited recline. Proximity to the lavatories may be bothersome. 63 E None No Power Seat 63 E is in the last row of the aircraft and may have limited recline. Proximity to the lavatories may be bothersome. 63 F None No Power Seat 63 F is in the last row of the aircraft and may have limited recline. Proximity to the lavatories may be bothersome. 63 G None No Power Seat 63 G is in the last row of the aircraft and may have limited recline. Proximity to the lavatories may be bothersome. 7 A None No Power Seat 7 A is a Prestige Class angle lie flat seat and has extra legroom due to the bulkhead, but the proximity of the lavatory and galley can be bothersome. There is no floor storage during takeoff and landing. This is a bassinet position so passengers with infants are often seated here. 7 B None No Power Seat 7 B is a Prestige Class angle lie flat seat and has extra legroom due to the bulkhead, but the proximity of the lavatory and galley can be bothersome. There is no floor storage during takeoff and landing. This is a bassinet position so passengers with infants are often seated here. 7 D None No Power Seat 7 D is a Prestige Class angle lie flat seat and has extra legroom due to the bulkhead, but the proximity of the lavatory and galley can be bothersome. There is no floor storage during takeoff and landing. This is a bassinet position so passengers with infants are often seated here. 7 E None No Power Seat 7 E is a Prestige Class angle lie flat seat and has extra legroom due to the bulkhead, but the proximity of the lavatory and galley can be bothersome. There is no floor storage during takeoff and landing. This is a bassinet position so passengers with infants are often seated here. 7 F None No Power Seat 7 F is a Prestige Class angle lie flat seat and has extra legroom due to the bulkhead, but the proximity of the lavatory and galley can be bothersome. There is no floor storage during takeoff and landing. This is a bassinet position so passengers with infants are often seated here. 7 H None No Power Seat 7 H is a Prestige Class angle lie flat seat and has extra legroom due to the bulkhead, but the proximity of the lavatory and galley can be bothersome. There is no floor storage during takeoff and landing. This is a bassinet position so passengers with infants are often seated here. 7 J None No Power Seat 7 J is a Prestige Class angle lie flat seat and has extra legroom due to the bulkhead, but the proximity of the lavatory and galley can be bothersome. There is no floor storage during takeoff and landing. This is a bassinet position so passengers with infants are often seated here. 8 A None No Power Seat 8 A is a standard Prestige Class angle lie flat seat. 8 B None No Power Seat 8 B is a standard Prestige Class angle lie flat seat. 8 D None No Power Seat 8 D is a standard Prestige Class angle lie flat seat. 8 E None No Power Seat 8 E is a standard Prestige Class angle lie flat seat. 8 F None No Power Seat 8 F is a standard Prestige Class angle lie flat seat. 8 H None No Power Seat 8 H is a standard Prestige Class angle lie flat seat. 8 J None No Power Seat 8 J is a standard Prestige Class angle lie flat seat. 9 A None No Power Seat 9 A is a standard Prestige Class angle lie flat seat, although proximity to the lavatory, galley, and stairs may be bothersome. 9 B None No Power Seat 9 B is a standard Prestige Class angle lie flat seat, although proximity to the lavatory, galley, and stairs may be bothersome. 9 D None No Power Seat 9 D is a standard Prestige Class angle lie flat seat, although proximity to the lavatory, galley, and stairs may be bothersome. 9 E None No Power Seat 9 E is a standard Prestige Class angle lie flat seat, although proximity to the lavatory, galley, and stairs may be bothersome. 9 F None No Power Seat 9 F is a standard Prestige Class angle lie flat seat, although proximity to the lavatory, galley, and stairs may be bothersome. 9 H None No Power Seat 9 H is a standard Prestige Class angle lie flat seat, although proximity to the lavatory, galley, and stairs may be bothersome. 9 J None No Power Seat 9 J is a standard Prestige Class angle lie flat seat, although proximity to the lavatory, galley, and stairs may be bothersome. 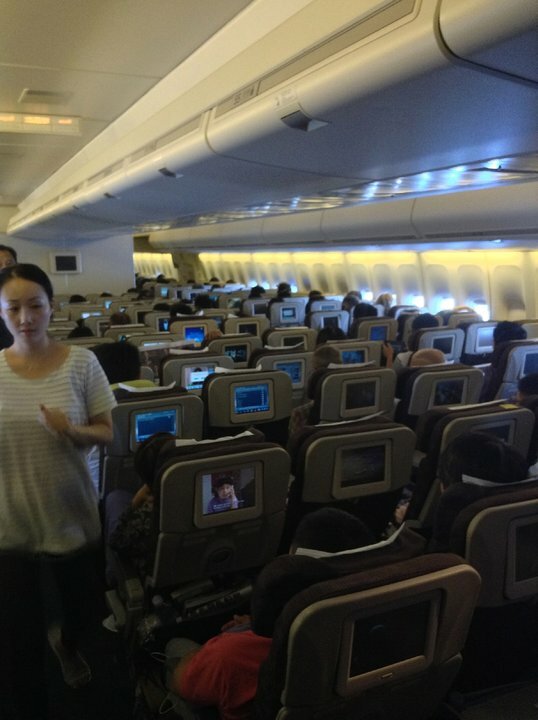 Korean Air offers audio selections in all classes of service with Audio and Video onDemand. 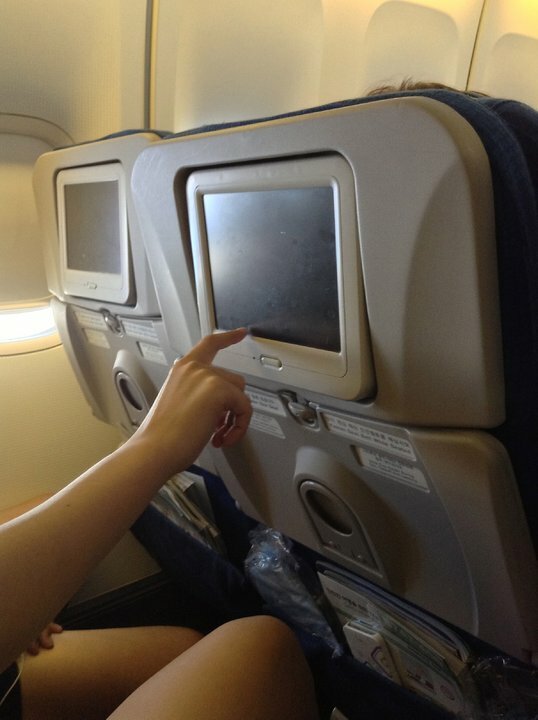 This aircraft offers personal seatback Audio and Video onDemand TV's in all classes on service. AVOD allows passengers to select any channel at any time. First Class and Prestige Class seats are equipped with a 10.4-inch LCD monitors, and Economy Class seats are equipped with a 8.4-inch LCD monitors. All classes of service have access to an AC power port. Korean Air operates three versions of the B747-400 aircraft. This version is equipped with 365 seats and offers three classes of service: First, Prestige, and Economy. Seats in First Class are flat bed seats, while seats in Prestige are angled flat seats. 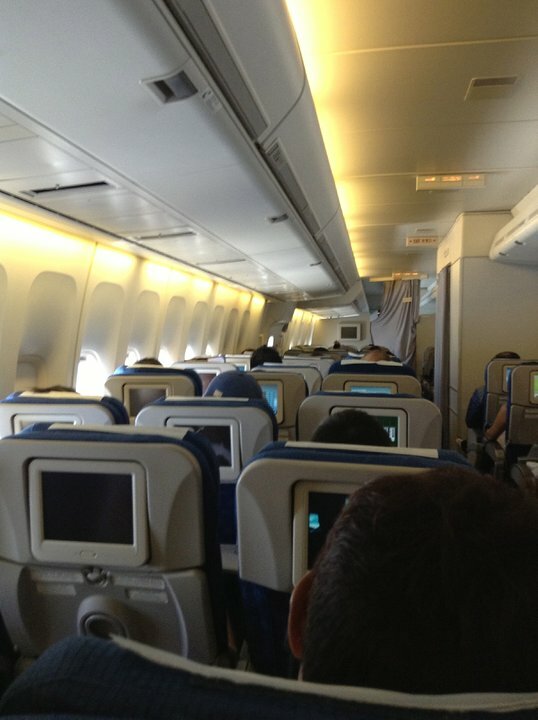 All seats on this aircraft are fitted with AVOD entertainment and in-seat power ports. The following rows may be used as reference: First Class are rows 1-3; Prestige Class are rows 7-21; and Economy ends at row 63. Seat 19J faced the flight attendant, so while the service on my route was amazing, I'm not sure I'd want to be stuck in that position. Short hop from HKG to ICN, First Class, 28 Sep 2015. Wife and I were the only passengers. This plane has the "old" first class sleeper seats; although they look like abandoned business class seats from an earlier generation, these are super compfortable for a day flight and close enough to permit proper converstaion with my wife. 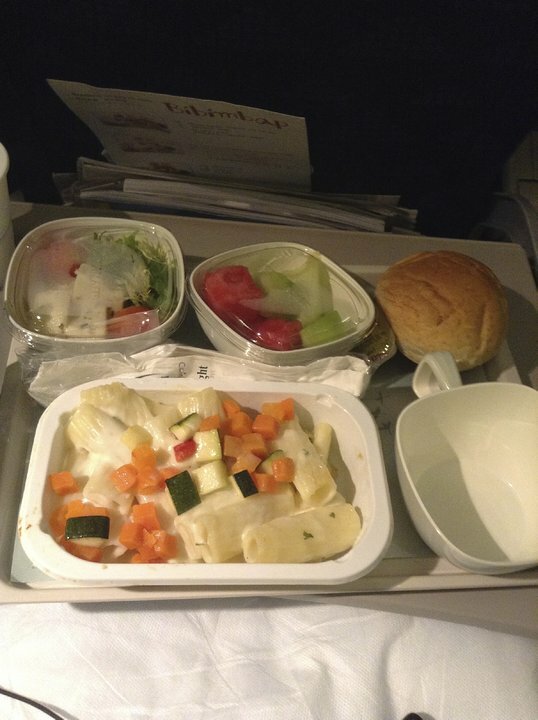 Cabin crew were excellent, meal, as ever with KE, was a slightly offbeat menu and delicious. Upper deck business class very quiet. The angled seats do not lie flat so there is a slope to them which can be frustrating if you are used to the true lie-flat on other planes. However, they are wide and comfortable. Side storage bins allow for easy access to belongings. Clean and quiet lavs, good service. Narrow stairs to the upper deck so if you are unstable on steps with your luggage, choose the main deck. Lots of personal space and privacy. Highly recommended. 38 and 48 A and K, ie, window seats in the emergency exit rows: The apparatus for the plane's door bulges in front of the window seats substantially, about 6", or enough that I could not comfortably stretch out both legs. The employee at the check-in counter warned me, and this seat is still far preferable to non-exit-aisle seats, but be warned. Korean Air flies 5 versions of Boeing 747-400 V1.